Total surrender is easy, right? Well, as a Christian, it should be easier, in theory at least. In this podcast, we will discuss a way that is helpful to let go and let God. How can we give God a total surrender of our concerns, worries, and problems if we do not trust? This is a question I’ve had time to reflect upon lately and I am not happy to say that after thinking about it, I’ve come been helped by certain realizations I’ll share with you. One is that we sometimes use God only in the sense of need – when we need him we pull him off that figurative shelf. While this sounds sacrilegious we have all done it from time to time. Think about it – when all is going well do we cry out to God. No, because there is no need, but when we need him, we “cry out,” and wonder why He does not appear to answer. So we resort to that very human element in our lives worry. Is there something that will change if you worry? Is there something you can do about the situation you worry about? By insisting in prayer to God that he changes the outcome to the one you want, are you convinced He will hear and answer your prayer the way you want Him to? Truthfully that last one is what hit me. I wanted to know why God was not answering my prayer and it was for someone else. I found out that I could not control the situation (I’m sure you’ve already figured that one out) and while I could pray — and I am positive the prayer was heard, the outcome was not what I hoped for. The good news, it was not a life and death situation. Sometimes what we love the most is what is taken away from us in order that we turn to Him. I’m talking about a career, an achievement, or something that is more on the superficial human level here. My husband always said, “God gets my attention when I don’t have much work.” He is self-employed and our work is steady only by the grace of God – to Him we give all the glory. Is God getting your attention, and instead of total trust we worry? A decision – I will totally surrender to you, Lord. 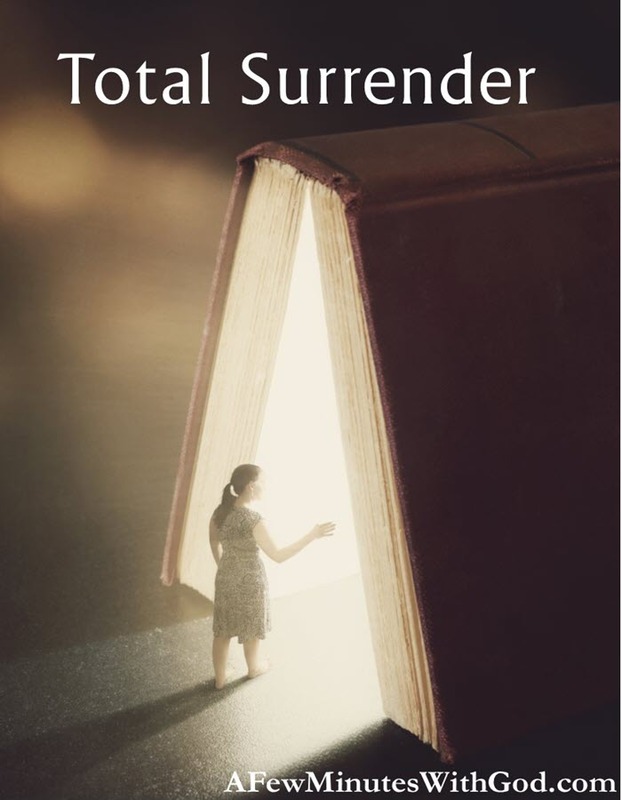 A recommitment daily if not minute-by-minute to total surrender. A realization and acceptance of a different outcome than what we hope for. A peace – knowledge that God IS always there for us. The belief that God will give us the grace we need to do this! Let’s pray with expectant hearts! Dear Lord, total surrender to you is an absolutely freeing idea and I pray that you give me the grace to surrender all of my problems, my concerns for those in my family, for myself, for those who are struggling. I place all of the issues I have into your very capable hands. You Lord know all things and I know you have my best interests at heart. You care is for my salvation Lord, and I pray a total trust in you. Jesus, I trust in You! Dear Lord, help me especially to surrender the following prayer intentions: (family, friends, work, home, etc.) Lord, I know that you hear me and I especially pray for the grace that comes from the Holy Spirit to shower upon me and bring me that peace that surpasses all understanding. And, I pray this in the Name of Jesus, Amen.